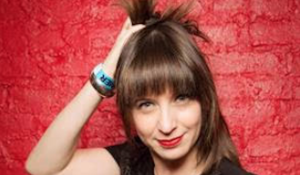 Storyteller and comedian Ophira Eisenberg (host of NPR’s “Ask Me Another”) returns to Bucks County Playhouse for a one-night only performance on April 6 at 8 p.m. “Leaving A Mark” will also feature cameo performances from acclaimed storytellers Mike Albo and Michaela Murphy. Eisenberg leads the audience through an imaginative and funny examination of the marks and scars life experiences can leave behind, and explores themes of identity, and the journey between broken and whole. She previously appeared at Bucks County Playhouse in the “WORD OF MOUTH: WHOOPS” storytelling event in September 2018. Canadian-born Eisenberg hosts NPR’s nationally syndicated comedy/trivia show “Ask Me Another,” where she interviews and plays silly games with Sir Patrick Stewart, Awkwafina, Roxanne Gay, Terry Crews, Jessica Walter, Josh Groban, Nick Kroll, Tony Hawk, George Takei, Sasha Velour, Ethan Hawke, Julia Stiles, Lewis Black, Uzo Aruba, Michael C. Hall and more. She has appeared on Comedy Central, “This Week At The Comedy Cellar,” The New Yorker Festival, Kevin Hart’s “LOL Network,” HBO’s “Girls,” “Gotham Live,” “The Late Late Show,” “The Today Show,” and VH-1. Mike Albo is a writer, performer and humorist. His solo shows include “Spermhood: Diary of a Donor” and “The Junket,” both directed by David Schweizer. “The Junket” ran off Broadway at the Lynn Redgrave Theater in 2014. He is the author of the novels “Hornito” (HarperCollins) and “The Underminer” (Bloomsbury, co-written with Virginia Heffernan) as well as the e-books “Spermhood” and “The Junket.” He is also a part of the long-running comedy trio, “Unitard,” which has a continuing residency at Joe’s Pub in New York City. Michaela Murphy is a writer, playwright, storyteller and teacher. Her stories have been featured on NPR, Off-Broadway (Second Stage Theater), The Moth Mainstage (NYC and National Tours) and Peabody Award-winning “The Moth Radio Hour,” “The Liar Show,” “RISK!” and “TEDx,” the Clinton White House and in “The New Yorker.” She is formerly the Director of Education at Second Stage Theater and was a guest Artistic Director for several of The 52nd Street Project replications (Navajo and Chippewa Nations). Tickets are $30 and available online or by calling (215) 862-2121.